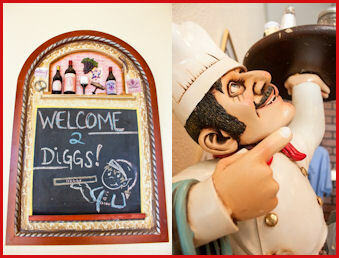 Diggs Pizza has been in business for over 15 years. We put a lot of love into making our own dough, (which is hand tossed) blending our own sauce and cheese. We use only fresh vegetables for toppings, sandwiches, salads and soup. We also offer a gluten free pizza, which we will top anyway you want. We are known for over topping our pizzas, so you will definitely get your money’s worth! We are located at S. Cole and Amity in the Indian Lakes shops (map it). We offer dine in, carry-out and delivery. We are sorry to say our delivery area is smaller than we’d like, so click here to see if you are in our area.